Construction of our current church building and 175-foot bell tower began in 1891 and was completed in 1895. It was designed by Swiss architect Henry J. Hefty to resemble the Old South Church in Boston. The building is considered to be one of the few examples of Venetian Gothic architecture in the United States. 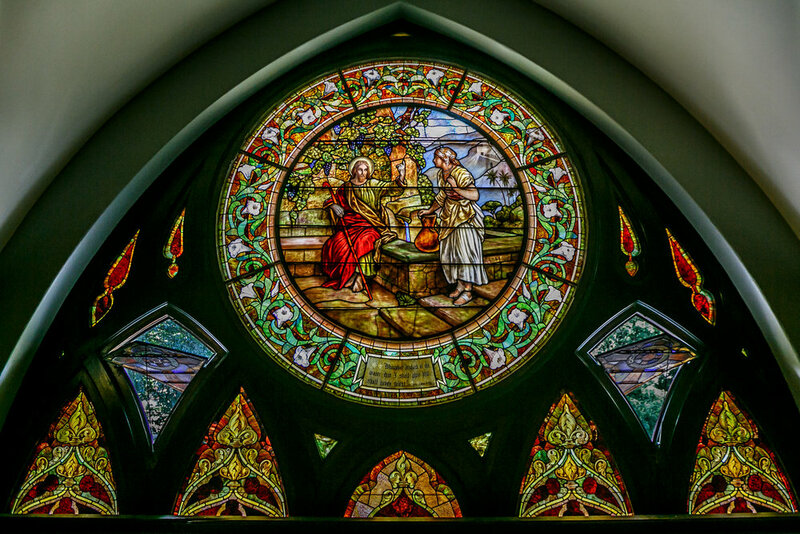 The stained glass windows were commissioned in 1906 and designed by Povey Brothers of Portland. The building originally included not just the 175-foot bell tower, but also two smaller 100-foot towers and a cupola. Due to extensive damage from weather and pigeons, the smaller towers and cupola were removed in 1951. The historic building remains on many walking tours of Portland. The church's first pipe organ (2 manuals, 21 ranks) was built by Hook & Hastings in 1883. It was moved from First Congregational's previous building when the current edifice was completed in 1895. This mechanical-action organ was replaced by an electro-pneumatic Casavant (3 manuals, 30 ranks) in 1950. Our current pipe organ was designed and built by our current organist, Grant Edwards, in collaboration with Bond Organ Builders. It incorporates the windchests and bellows system from the previous Casavant, as well as casework and front pipes built by Odell in 1877. Although it appears deceptively original to the church, this casework was installed in 2005, having been salvaged from Old St. Mary's church in Oakland, California. The front pipes, all of which are speaking, were painted and stenciled by Grant Edwards. The instrument contains a mixture of vintage and new pipes, including a Great Open Diapason built by Hook & Hastings in the Victorian era.